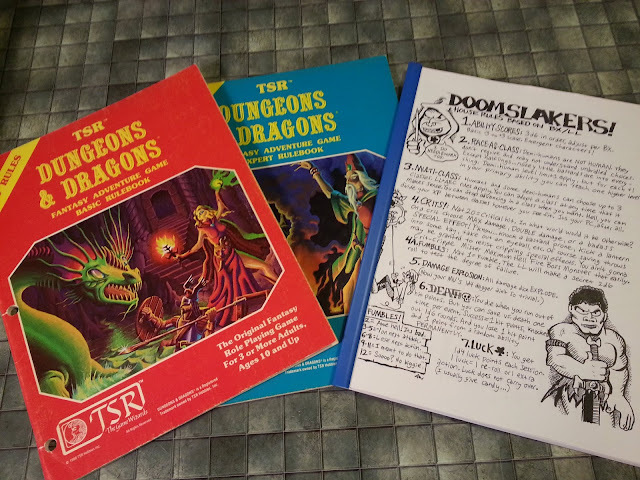 [When I put up Monday's post featuring a pair of TSR's Dungeons & Dragons comic ads from the early 1980's it was merely as a means to share a little nostalgia from a personal perspective. 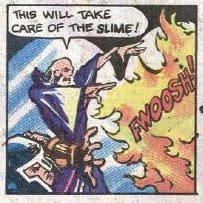 A single-frame recap of the previous adventure's cliffhanger (and our introduction to one of my "Mount Rushmore" D&D monsters, green slime), there's not much to say about this frame. Although we've obviously witnessed a change of artist. 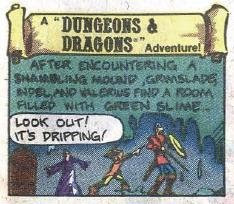 Oh, and I especially like how the synopsis text is placed within the dripping green slime. Brilliant! Here we get to witness Indel's first meeting with an unlucky event - in this case, having a Carrie moment with a bucket-full of green slime. We also are shown Valerius' alignment - although I think we could have guessed it by the end of the last ad: neutral. Although it could be argued that he's chaotic, I don't think he's exhibited any truly chaotic behavior. On the other hand, he has exhibited a strong concern for his own well-being. 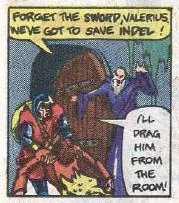 Case in point: poor Indel's being dissolved by slime, and Valerius' primary concern is his 10gp sword. 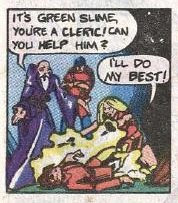 Grimslade is obviously the take-charge member of the group, exhibited here by his yellow-emphasized orders to Valerius. I can almost hear the fighter's deadpan delivery of: "I'll drag him from the room!" I'm sure it's delivered in the same tone my teenage sons use when they say, "I'll go clean up my room!" after being ordered to do so. In fact, Valerius is probably as concerned about Indel's fate versus that of his sword as my boys are over the cleanliness of their rooms versus their video games. ...and discovering untriggered traps. This frame introduces us to the pit trap, but it also gives us the chance to see yet another unfortunate event befall the elf. Now, I don't know about you, but I'm starting to wonder what's up with that character. Is he really that lacking in perceptive talent? Is his player a lousy die roller? Did his player piss off the DM? Whatever the reason for his misfortune, as I mentioned in comments elsewhere on this blog, I believe Indel to be a serious threat to the party. His continued need of being rescued means the party must endanger themselves and use valuable resources to do so. Were I playing Valerius, it'd be a safe bet that Indel would suffer from a fatal "accident" before too much longer. 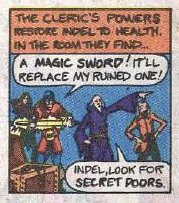 And we conclude this ad with another cliffhanger, this one also involving - or perhaps caused by - Indel the unlucky elf. The DM's used the elf to lure the players into sending their characters ever deeper into his deathtrap - er, dungeon. Probably to a deeper level, where they will likely face challenges far beyond their abilities, and where - if they don't keep their wits focused to a razor-sharp edge - they will certainly perish. 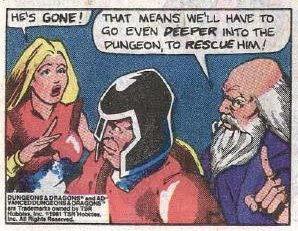 Sounds like my kind of Dungeon Master! Is it genuine naiveté, or only feigned for the sake of your dialectic? Clearly Indel is an NPC used by the cunning DM to lure the party into more dangerous and deadlier situations. I can only assume that your mock surprise at this analysis will be overturned upon your readers in a single mighty bolt from the blue of clear reasoning and instructive mastery. To grind home the perils of ill-equipped understanding of the esoterica of Early-/Mid-era Deeandeeisms upon novice gamers making their forays into the symbolic interpretations of Mankind's ignorance. For what is the dungeon but a metaphor for a human's gross and weighty insensibility in this perilous and godless universe of random chance and impermanent lucid thought? Sir, I salute you and your cunning methods! I believe Indel to be a serious threat to the party. 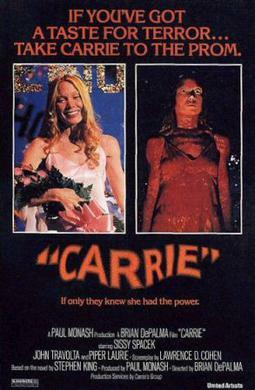 Though not there explicity to 'lure the party into more dangerous and deadlier situations', but rather to be Chandler's 'man coming through the door with a gun in his hand' whenever the action is flagging. 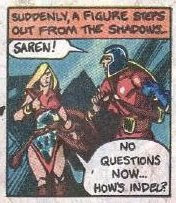 GM: Okay, suddenly Indel falls through a previously undiscovered trap door. What do you do? The Aaaagh/It's eating my sword! exchange is priceless and something I have seen from players over the years. Your panel commentary is also superb. Thank you for posting these. 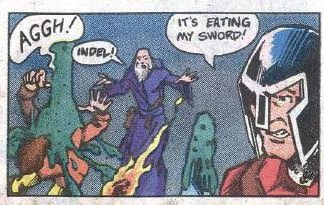 Poor Indel. Dude can't catch a break. I like how the pit trap didn't necessarily mean instant death, but was instead a reason to delve deeper. @rainswept: Your blog is "full of win". Alas, I fail my resistance roll and was compelled to Subscribe. Ooh, ooh, when is the next instalment? --I'm waiting for the Bill Willingham issues. I've never before bothered to look at these comics with a critical eye...I have to say your analysis is right on, as well as very funny. I'm only sorry there aren't more of these comics.